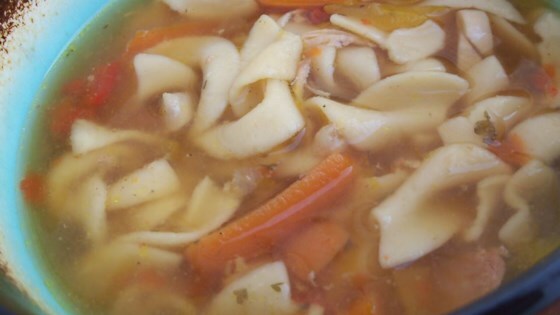 "This is a wonderfully easy soup to cook while at work or on a busy day! This can be 'soupy' with more broth; or sometimes I like to thicken the juice with a little water and cornstarch mixture and let cook till thick. Then it is good served over mashed potatoes! Enjoy!!" When chicken is tender, remove from the slow cooker and tear or chop into bite-sized pieces. Set aside in a small casserole dish to keep warm. Turn the slow cooker up to high heat and stir in the frozen egg noodles. Cook until noodles are tender then return the chicken pieces to the broth. Adjust seasonings to taste.